For the second straight night, we ran into some tough luck with our Best Bet as the Flames lost 4-2 to the Canucks despite dominating the game, outshooting Vancouver 46-13. It was the largest margin the Canucks have been outshot by in a victory in franchise history. Overall, it was another 3-3 night as we continue to tread water in the first week of January. The Leafs easily covered the first period line in New Jersey, leading 4-0 after 20 minutes. And the Avalanche finally earned a victory at home, defeating a rusty Islanders squad 2-1 in OT. There are 12 games tonight in the NHL. We’re due for a breakout day, and there’s no better time to get it, starting with a Best Bet in the early action. Good luck today! Reasons to bet Winnipeg: The Jets have won 2 straight, 4 of 6 and 6 of 9. Buffalo has allowed 3+ goals in 7 of its last 8 games. Reasons to bet Buffalo: The Sabres beat the Jets 3-1 earlier this season in Winnipeg (Oct. 30). Reasons to bet Tampa: The Lightning has beaten Philadelphia twice this season and 12 times in the last 16 meetings. The Flyers have lost 5 straight games and 7 of 8. Reasons to bet Philadelphia: The Flyers are 12-6-3 at home and Tampa has lost 8 of its last 9 road games. The Lightning has allowed 3+ goals in 5 of its last 6 games. Reasons to bet Minnesota: The Wild overcame a 4-2 third-period deficit to beat the Sharks Thursday in San Jose and improve to 12-1 in their last 13. LA has scored just 8 regulation time goals in its last 6 games. Reasons to bet Los Angeles: The Kings look to bounce back from a 4-0 loss at home Thursday to Detroit. Minnesota has allowed 4 goals in each of its last 3 games and 4 of 5. Reasons to bet Edmonton: The Oilers are 11-6-5 on the road this season and coming off a 4-3 win Thursday in Boston. New Jersey played last night, losing 4-2 at home to the Leafs, and is playing its 4th game in 6 days. Reasons to bet New Jersey: The Devils outshot Toronto 32-14 in last night’s loss and had won 3 of their previous 4 games. Edmonton’s allowed 3 goals in 4 of its last 5 games. Reasons to bet Washington: The Capitals have won 4 straight, including a 5-0 whipping of Columbus Thursday that snapped the Blue Jackets’ 16-game winning streak. Ottawa has dropped 3 straight. Reasons to bet Ottawa: The Senators are 11-5-4 at home this year and have won 10 of their last 14 home games versus Washington. Reasons to bet Montreal: The Canadiens haven’t lost to Toronto in more than three seasons, going 16-5 in the last 21 meetings. 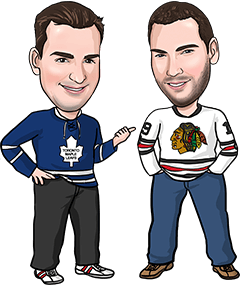 Reasons to bet Toronto: The Leafs are 6-0-1 in their last 7 games and have earned points in 10 of their last 11. Montreal is playing its final game of a 7-game road trip. Reasons to bet Boston: The Bruins have have won 22 of their last 27 meetings with the Panthers, including all 3 this season. Florida has won just twice in its last 7 games. Reasons to bet Florida: The Panthers snapped a 5-game losing streak at home last night with a 2-1 win over Nashville. Boston has lost 4 of its last 6 games. Reasons to bet New York: The Rangers have won 4 of their last 5 games and 7 of 10. Columbus had its 16-game winning streak snapped Thursday with a 5-0 loss in Washington. Reasons to bet Columbus: The Blue Jackets are 15-3-1 at home this year and have still scored 3+ goals in 15 of their last 17 games. New York has allowed 28 goals in its last 7 games. Reasons to bet Dallas: The Stars are 4-1-2 in their last 7 games. St. Louis has lost 7 of its last 11. Reasons to bet St. Louis: The Blues are 15-4-4 at home and have beaten the Stars in 12 of the last 17 meetings. Dallas is 5-9-4 on the road and now without captain Jamie Benn. Reasons to bet New York: The Islanders shook the rust off from a 5-day break last night in Colorado. Arizona has lost 9 straight games and is 1-6-2 in its last 9 home games. Reasons to bet Arizona: The Coyotes have won 3 of their last 4 home games against the Islanders. New York has just 4 wins in 15 road games this season (4-8-3). Reasons to bet Vancouver: The Canucks have won 6 straight games, allowing just 9 goals during the winning streak. Calgary is only 10-10 at home. Reasons to bet Calgary: The Flames outshot the Canucks 46-13 last night despite losing 4-2 in Vancouver, and have outshot the Canucks 83-27 in the last 2 meetings. Reasons to bet Detroit: The Red Wings blanked the Kings 4-0 Thursday in LA to improve to 10-7-2 on the road this year. San Jose has lost 3 straight games, including a 5-4 loss to Minnesota Thursday when the Sharks blew two 2-goal leads. Reasons to bet San Jose: The Sharks should bring a complete focus to this game after that disappointing loss Thursday. Detroit is playing its 5th straight road game and 3rd in 4 nights.